The 17th Australian International Aerospace Congress is taking place in Melbourne from 26 February 2017 – 02 March 2017. The submitted abstract titled “StopRotor – A new VTOL aircraft configuration” has been successful and will be included as an oral presentation at the 2017 event. Team members include Prof Roberto Sabatini, Dr Matthew Marino, Dr Janek Ambani and inventor Rowan Watkins. Abstract: The StopRotor Unmanned Aerial Vehicle (UAV) is a new aircraft configuration capable of both rotary and fixed wing flight. The design combines the utility of the open rotor system with fixed wing efficiency by in flight configuration changes. The novelty of the platform is evident in its ability to dynamically change from one configuration to another. 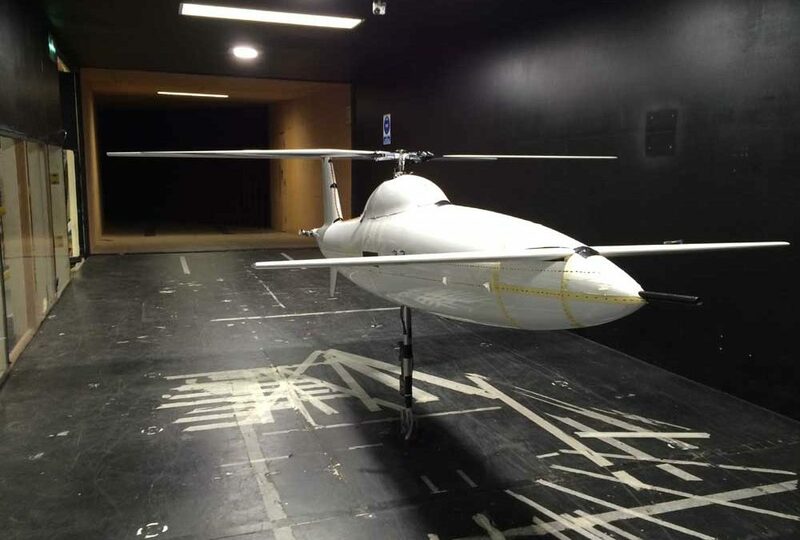 It is capable of performing similar to that of a helicopter allowing Vertical Take Off and Landing (VTOL) while also capable of loitering attitudes. The platform can also transition into a fixed wing mode to expand its range and endurance to that of a typical fixed wing UAV. The StopRotor is capable of carrying a 40% payload relative to its empty flying weight. The optimization of the platform for an expanded range, endurance and mission capability relies on the ability to model the platform. A model is also needed to accurately represent the Stoprotor in a representative mission scenario to increase confidence on its operational performance in range, endurance and manoeuvrability. Due to its unique design, standard methods of aerodynamic approximation needed modification and required both simulation and experiments to develop an accurate model. Through Vortex Lattice Method (VLM) analysis and experimental aerodynamic validation, the full 6 Degree of Freedom (6DOF) model was developed for performance and manoeuvre estimations. Experimental testing was performed at the RMIT Industrial Wind Tunnel. Tests were conducted at representative flight velocities. The correlation between the VLM and experimental results were favourable and increased confidence in using approximated derivatives that could not be obtained through static wind tunnel tests. Key performance parameter include CD0 = 0.037, L/Dmax = 17, VStall = 15ms-1, CLmax = 1.6. Outdoor flight tests will validate the stability and control parameters using a suitably developed Flight Test Instrumentation (FTI) system for Time and Space, Position Information (TSPI), acceleration and attitude data recording, while also assessing the manoeuvring capability and response to atmospheric turbulence. For more AIAC event information please visit AIAC 2017.